TORONTO, January 21, 2019 – Rethink Breast Cancer and iMD Health are pleased to announce that they have formed a strategic partnership whereby Rethink Breast Cancer content will be made available through iMD’s digital patient engagement platform. As of today, iMD users will be able to access the various Rethink Breast Cancer resources through iMD across Canada. iMD Health is Canada’s leading medical technology innovator providing a digital, interactive, educational approach to the examination/counseling rooms of Family Physicians, Specialists, Nurses and Pharmacists to provide the latest health information to patients “At The Point of Care”®. Rethink Breast Cancer is a Toronto-based charity organization that empowers young women worldwide who are concerned about and affected by breast cancer. By taking a breakthrough approach in all aspects including education, resources, advocacy, community engagement and fundraising, Rethink is thinking differently about breast cancer. Rethink’s Care Guidelines for Young Women with Breast Cancer to help direct health-care providers and inform young women with breast cancer on their unique cancer care needs. The Cancer Fabulous Diaries, documenting Canadian thriver Sylvia Soo’s journey with breast cancer. Two comprehensive guides for parents to help them navigate discussions about cancer with their children. A selection of videos chronicling everything from medical cannabis to wig care. “This partnership is very exciting for both organizations”, says Kevin Delano, President and CEO of iMD Health Global. “It utilizes the iMD distribution channels as a leading educational tool that patients need. Our iMD solutions are used across Canada by private practices, large medical centres, pharmacy stores and now, within hospitals. “Working with Rethink Breast Cancer, we are now providing important health information and education to tens of thousands of young women, impacting their health literacy and understanding of their condition”. “We are thrilled that our partnership with iMD can help us reach so many more young women and health-care professionals”, says MJ DeCoteau, Founder + Executive Director of Rethink Breast Cancer. “After our research showed difficulties in young women accessing information and options related to fertility, breast reconstruction and timely community resources for help with childcare, finances, and relationship challenges, we developed special Care Guidelines to help address these unique needs. Rethink Breast Cancer’s mission is to empower young people worldwide who are concerned about and affected by breast cancer. Rethink is the first ever Canadian charity to bring bold, relevant awareness to the 40s and under crowd; foster a new generation of young and influential breast cancer supporters; infuse sass and style into the cause; and, most importantly, respond to the unique needs of young women going through it. By taking a breakthrough approach to all aspects of breast cancer – education, resources, advocacy, community building, and fundraising – Rethink is thinking differently about breast cancer. To find out more, visit rethinkbreastcancer.com. iMD Health Global is a Canadian-based, award-winning software development company focused on innovating within Canada’s healthcare space. 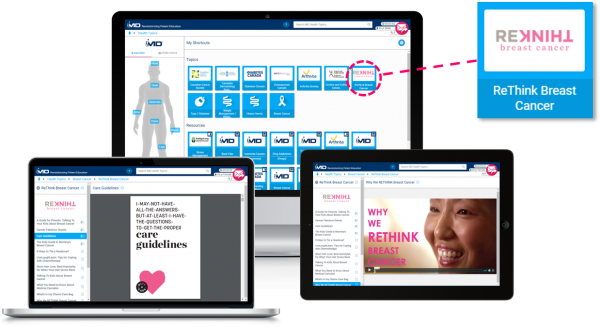 Since 2010, iMD has grown its flagship product – app.imdhealth.com – into Canada’s largest digital patient education and engagement platform. Centred At The Point of Care®, healthcare professionals use iMD’s cloud-based platform to engage with their patients at a deeper level and optimize knowledge transfer surrounding a patient’s condition and treatment plan. This is done through the seamless integration of over 50,000 patient-friendly diagram, booklet, and video resources (covering 1,800 medical topics) from over 60 of Canada’s leading Health Associations (as well as the MAYO Clinic) into an award-winning user interface that makes patient education both efficient and effective. At the end of a patient’s visit, a summary of all the discussed information can be emailed or printed for the patient to review and continue their learning journey at home, improving their health literacy and adherence to their treatment plan. The iMD Platform is accessed today by over 6,000 Users in the following healthcare settings: doctors’ clinics, hospitals, pharmacies, infusion clinics and home environments.